Fili grew up under less than stellar circumstances, stating that family violence and drugs, were frequent scenes in his household environment. 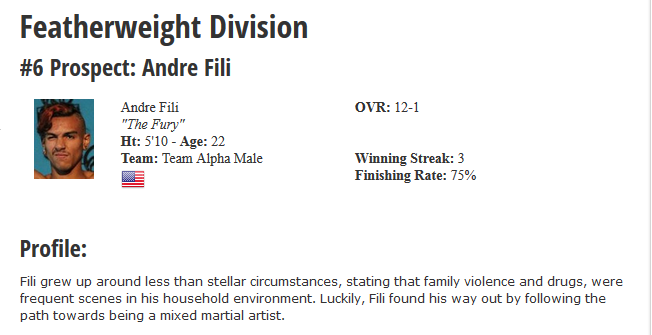 Luckily, Fili found his way out by following the path towards being a mixed martial artist. Fili made his MMA debut in 2009, winning his first 4 fights via TKO or knockout. Fili next faced off against Team Alpha Male fighter Derrick Burnsed in a 5-round title fight at 155 lbs. Supposedly WEC scouts were in attendance to watch Fili, but he ended up being carried out of the cage after a 5th round knee injury. 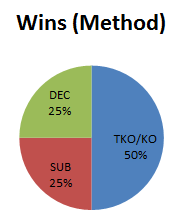 Prior to the injury, it was a close fight, though Burnsed had arguably started to pull away in the last couple rounds. After more than a year out of the cage, Fili returned with a vengeance, winning 6 fights in a year’s time. During that winning streak, Fili signed on with Tachi Palace Fights (TPF), having won his debut over Ricky Wallace at TPF 14. Fili was set to face TUF 15 alumni Chris Saunders at TPF 15, but Saunders was replaced by veteran Enoch Wilson. Fili used his wrestling and conditioning to keep Wilson on his back for the majority of the fight to win a unanimous decision. Unfortunately, Tachi Palace Fights temporarily closed their doors and Fili was left without a fight for nearly 6 months. Luckily, Fili was still the reigning Featherweight champion of West Coast Fighting Championships, and they were able to fill the void by offering Fili an opportunity to fight fellow prospect Adrian Diaz. Fili and Diaz both landed their fair share of punches, but it was Fili’s furious 3rd round blitzkrieg that ultimately led to his TKO win. Fili has an upcoming bout scheduled in Japan’s Pancrase organization, but an opponent has yet to be announced. Fili trains at Team Alpha Male alongside UFC stars Urijah Faber, Chad Mendes, and Joseph Benavidez. Fili’s long frame and lack of wrestling pedigree seem to be a strange fit for the camp, but by all accounts, Fili’s personality fits right in with his fellow training partners. Fili’s wrestling has noticeably improved over the course of his career and with the recent addition of striking coach Duane Ludwig, Fili may be able to take his career to the next level. Fili is a solid prospect, with a great record and a very charismatic personality that will lend itself towards making him a fan favorite. The main issue I have with Fili’s ability as a future top-flight contender is his lack of polish regarding his technical skills. On one hand, his unpredictability and unorthodox style keeps his opponents guessing, but there are times where he just simply leaves himself wide open for counter attacks. UFC-quality competition will take advantage of those mistakes, where as now, Fili is able to get away with it and still win fights. Fili has a solid chin, evidenced in Video 1. He is a willing and able brawler, but it is his well-rounded package of skills that truly make him a Top 10 Prospect. He has great takedown defense, but he can also use his wrestling to bring things to the floor. His conditioning is excellent and his overall amount of passion in the cage seems to give him an edge in the later rounds. Fili is somewhat of a slow starter in his fights. I am not sure if that is actually part of his gameplan, but he seems willing to feel out his opponents first, and then apply whatever superior skill he has over his opponent to win the fight. As mentioned previously, that strategy lends itself to danger as he continues to step up his competition level. In his fight with Ricky Wallace, Fili was hit with some big punches, and luckily he was able to use his wrestling to expose Wallace’s ground game. A few months later against veteran journeyman Enoch Wilson, Fili was taken down and fully mounted, but he ended up transitioning out and securing top control for the majority of the fight. Fili always finds a way out of danger, but the concerning part is why he puts himself there in the first place. One thing for sure is that Fili is a gamer. He comes to fight. He puts on a show, and the fans go home happy. The UFC or Bellator would be proud to have a fighter like Fili in their organization.